Connect with social media leaders who share your interests at #FullMoonEngageMe, Empire.Kred's monthly networking event. #FullMoonEngageMe is run by players for players. It's a casual, low-key event that makes it easy to meet and connect with fellow players. Simply sign up in the EAv Gangstas community from February 19-23. Whether you have a few minutes or a few hours, it's your chance to build your network. 1) When the event starts on Friday, February 19th around 07:00 UTC the sign-up thread will unlock. Post your ticker (your user name) anytime before the thread locks on February 23rd to let other players know you want to play. 2) As other people post their tickers, take a minute to say hi and visit their social media networks. THIS EVENT IS ALL ABOUT CONNECTING. Consider following people on Twitter and Facebook, engaging on their blogs, visiting them on Google+, Instagram, or other networks. There is a FullMoon party every month, so you can focus on a different network each month or, if time allows, connect fully with everyone playing or zero in on people who share your interests. It’s up to you! 4) NEW? Running low on eaves (our game currency)? Established players help out by running missions to give you gifts you can use to buy anyone. Others run missions to give you shares of their stock FREE. This is a great time to join. TIP: Do as many gift and invest missions as you can to build your portfolio. 6) Leaders and seasoned players return month after month to connect and support new players. This month, you can buy shares, throw a pie, and - if you need eaves - the randomizer will return to the Leader Shop. The randomizer will spin every day during the Full Moon. Swing by daily and stock up when the discount hits. 2) Time-pressed? Eager to connect with top players fast? Consider buying the Ultimate Leaders Upgrade to get 5 million eaves and a package of in-game benefits worth more than $2,000. (Plus, gain immediate access to the exclusive Leader Shop.) This upgrade is yours for just $100 during your first 30 days. With Empire.Kred, running (or building) your social media programs is FUN. You can track your success on various social media channels right from your profile. Your daily dividends go up as you increase your engagement. Your real world social media engagement fuels your success in the game. 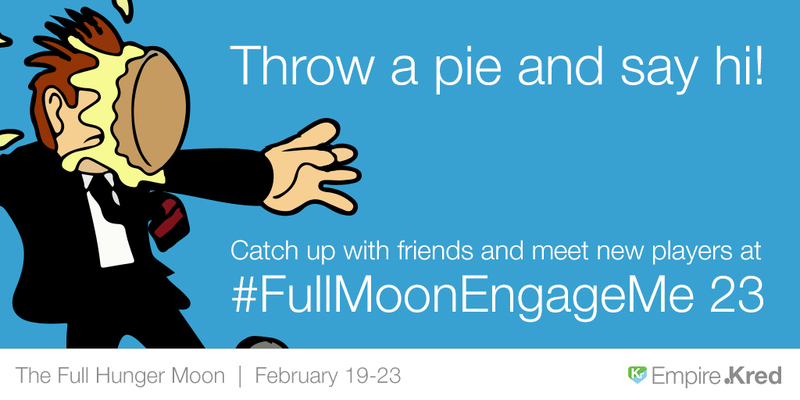 Plus, regular events like #FullMoonEngageMe make it easy to connect with people on your main social media accounts. It's a game, it's a proven way to meet people, build your audience, and share your content. That's why many people have played the game for close to five years.